Consulting can be grueling. Keeping your creative edge, and providing new and effective solutions – these are your differentiators in the marketplace. 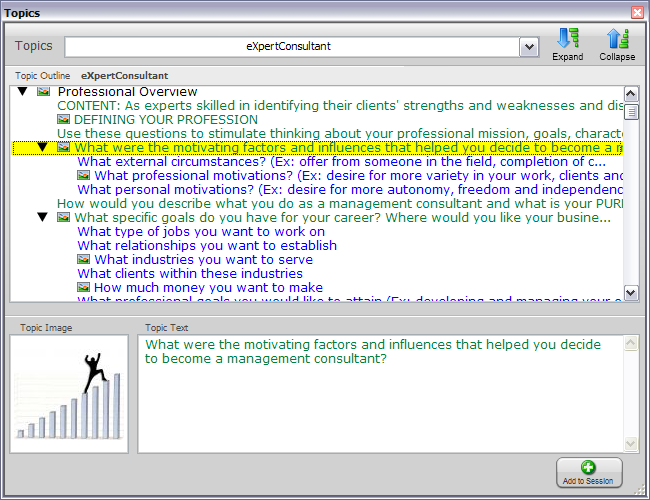 The Expert Consultant Module provides the support your consulting practice needs. It’s like having a brain trust at your beck and call, 24/7, with questions and prompts developed by some of the greatest minds in the consulting business. Think about either your needs or your client’s, then start asking questions. Using the powerful IdeaBrowser Association Engine, you’ll quickly arrive at solutions you never would have developed alone… and your clients will thank you for it. Similar to the legendary IdeaFisher Q-Banks, ThoughtOffice Expert Consultant provides powerful, authoritative guidance – take any problem or idea, & turn it into an effective, creative solution for your clients. To create Expert Consultant, we interviewed over 200 MBAs, CEOs, consultants, & successful executives to find out how they solve the problems they confront daily. Then we distilled their processes & advice into an Expert Topic Module you can tap with the click of your mouse. You get a tireless collaborator with no ego to bruise.